This village may be lost forever if developers Fairfield and Marchfield plus the UDC win their proposal to build 3000 + houses but which will have minimal services. Just another high-density, low-cost, low quality 'Dumpton' to blight our views. The developer appears to be operated by a Guernsey-based company, where, conversely, 'views' seem vitally important to the population and island finances. I've researched the locations of the directors homes here on the mainland and there's no sign of a 'Dumpton' near any of them. Just a collective of dark-suited 'spivs', long on 'self' but short on 'health' (spiritual). 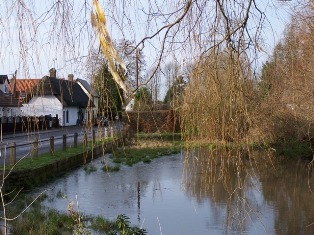 'The village is surrounded by well-ordered arable fields, woodland and heathland. The area is excellent for walking, enjoying the countryside and coast. There are opportunities to see wildlife and bird-watching is very popular'. His new £3 million 2-bed London apartment has a 45 foot lounge overlooking the Thames. How nice. 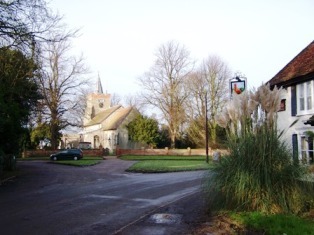 The Parish of Henham consists of Henham on the Hill, as it has been known in historical documentation, and the two hamlets Little Henham and Pledgdon (sometime known as Prison Green). 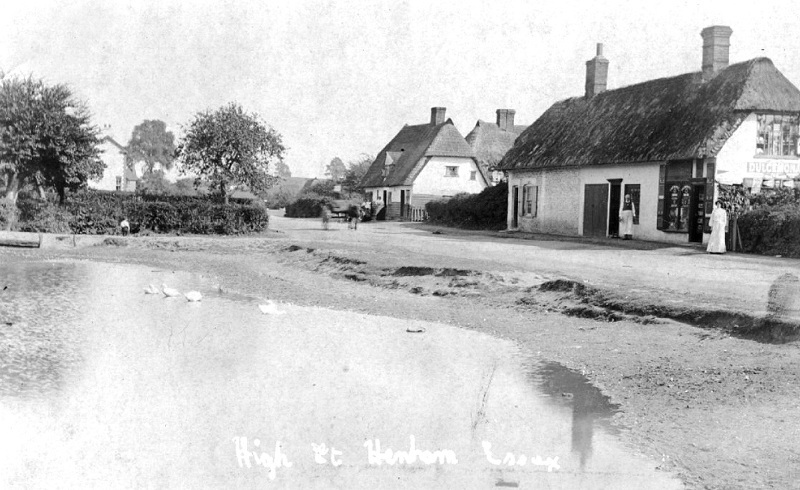 Henham is the third highest point in the county of Essex in England, Archaeological digs have revealed evidence of occupation during Neolithic and Roman times and the village is documented in the Domesday Survey of 1086. From England's Gazetteer BOOK II. HISTORY OF ESSEX. In length it is about three, and in breadth two miles: the village contains some good houses, and a place of worship belonging to the Independents; it is on high ground, pleasant, and healthy; distant from Bishop's Stortford seven, and from London thirty-seven miles. In the reign of Edward the Confessor, the lands of Henham belonged to Ailid, to two freemen, and to Ansgar, a sochman: at the time of the survey, they were in the possession of Ralph Baynard, Eudo Dapifer, and Geofrey de Magnaville. There are three manors; and the rectory is also a manor. Henham Hall is near the church; and the manor is what belonged to Ralph Baynard, from whom it passed to his son Geofrey, and to his grandson William, on whose forfeiture, for desertion of the cause of King Henry the First in his contest with Stephen, this possession was given to Robert, a younger son of Richard Fitzgilbert; whose son Walter was his successor, followed by Robert, son of Walter, who assumed the surname of Fitzwalter, borne by his noble descendants, barons of the realm, for many generations. Elizabeth, daughter and heiress of Walter, Lord Fitz - Walter,* conveyed this inheritance, by marriage, to Sir John Ratcliffe, who died in 1461. Robert, his descendant, created Earl of Sussex in 1529, to his second lady had Frances, daughter of Hercules Meutas, of West Ham, widow of Francis Shute, esq., and she, at the time of her decease, in 1627, held this manor of Henham, and the rectory, of the king by knight's service. Her daughter and heiress, was Jane, married to Sir Alexander Ratcliffe, who had this possession in 1635, which he sold to Lawrence Wright, M.D. of Dagenhams, in Havering: he died in 1657, and, with Mary his wife, was buried in the church of South Weald. Sir Henry Wright, bart. of the same place, was his son and heir: he married Anne, daughter of John, Lord Crewe of Stene, by whom he had Henry, who died in 1681, aged nineteen, and Anne. He himself having died before his son, in 1663, aged twenty-seven; they are both buried in the church of South Weald. The widow, Lady Anne Wright, enjoyed this estate as part of her jointure, till her decease, in 1708, when it descended to her daughter Anne, a very rich heiress; married, first, to Edmund, son of Sir Robert Pye, of Farringdon, in Berkshire; afterwards to William Rider, esq. She sold this estate in 1720, with the concurrence of the heirs-at-law, to Sir John Blount, bart., one of the directors of the South Sea Company; on the dissolution of which, it was purchased by Samuel Feake, esq., of Shering, succeeded by his son, Stephen Feake, and by J. S. Feake, esq. *This noble family resided a considerable time at Henham Hall. Robert Fitzwalter was born there in 1249 : as was also Walter, his son, in 1275 ; Walter, the son of Walter, in 1370, and Elizabeth, eldest daughter of Walter, Lord Fitzwalter, in MSO.—Monaslic. Anglic, vol. ii. p. 76. Dapifer;* next to whom the earliest possessor on record was Gilbert Peche in 1274, c H A F. and a second Gilbert Peche in 1322, held this manor of Adomar de Valence, Earl of Pembroke, by the service of a fourth part of a knight's fee ; as did also Gilbert, his son and heir. In 1360, it had become the property of John Malewayn; soon after which it again went to the Peche family, and was conveyed by Katharine, daughter and heiress of Sir Geofrey Peche?, to her husband, Thomas Notbend. She died in 1405, holding this estate of Ralph Neville, Earl of Westmoreland, as of his honour of Clavering. Mirabel, wife of Robert Geddying, and Margaret, wife of John Hinkley, were her daughters and co-heiresses. Afterwards the whole estate became vested in Margaret Hinkley, who died possessed of it in 1442, leaving her daughters, Alice, wife of John Marshall, and Cicely, wife of Henry Caldebeck, her co-heiresses. The last of these became ultimately possessed of this estate, leaving two daughters co-heiresses, Thomasine, married to John Turnor, of Haverhill, ancestor of the Tumors of Hallingbury, and Margaret, married to Geofrey Bloodwell, of Thurlow. Henry Turnor, son of John and Thomasine, married Elizabeth, daughter of Edward Brooksby, by whom he had Henry, who held this estate in 1520 and 1528: in 1613, it was holden by William Watts, esq. of Sir Francis Barrington, as of his manor and half hundred of Clavering ; with a portion of the tithes out of Plechedon Hall. Afterwards it passed to the Crewe family, and Nathaniel, Lord Crewe, Bishop of Durham, on his decease, in 1721, left it to Thomas Cartwright, esq., of Aynho, in Northamptonshire, who had married Armine, one of his brother's daughters: afterwards it belonged to William Cartwright, esq. The mansion belonging to the manor of the Broom, is a mile and a half south-west from the church. Of the proprietors of this estate there is no account from the first owner, Geofrey de Mandeville, to the reign of king James the first. In 1616, Sir John Watts died, holding this possession, whose heir was his son John; and early in the succeeding century it belonged to Sir Philip Parker, bart., of Arwerton, who sold it to Sir John Blount, of the South- Sea Company, and it was afterwards purchased by Mr. John Fell, wine merchant, from whom it passed to Joseph Fell, esq. of Saffron Walden. Little Henham is a hamlet, consisting of a few houses, about a mile north from Henham. The church has north and south aisles, the nave is separated from the chancel by a Church. * In Domesday, it is placed under the hundred of Clavering; and is stated to be a hamlet in Henham parish, belonging to the leet of Clavering hundred. Many instances occur in other counties of lands exempt from the jurisdiction under which they are situated, and annexed to distant lordships. Suene having been Lord of Clavering, may have had extensive authority here, and the hundred may have had its dependants, as the castle of Stortford had, from violence the country had its protection from inroads, in return for which, some estate had to pay towards their support. f Arms of Peche : Argent, a fesse gules, between two chevronels of the second. Screen, and the Gothic arches of the aisles supported by massive clustered pillars; the building is large for a country village. A massive tower at the west end, above which a lofty spire rises, contains a good ring of five bells. Plechedon Robert, son of Richard Fitz-Gislebert, gave two parts of his lordship of Henham to Canons Priory and canons of Little Dunmow; and his son Walter gave this church of Henham to the same appropriation : this gift was called a manor, and named Plechedon Canons: afterwards the rectorial, or great tithes, being retained by the priory, a vicarage was instituted and endowed in the reign of King Henry the Third, which continued in the patronage of the convent till its dissolution; and in 1536, the rectory and advowson of the vicarage were granted to Robert Ratcliffe, Earl of Sussex, from whom they passed to the successive owners of Henham Hall. Anne, daughter of John, Lord Crewe, married to Sir Henry Wright, bart., gave a farm at Little Henham, of about forty pounds a year, for the augmentation of this vicarage. In 1821, this parish, with the hamlet of Plechedon, contained eight hundred and four, and in 1831, eight hundred and sixty-three inhabitants. The Parish remained an almost exclusively agricultural community until the early 20th century. At that time there were about 14 different trades people here. We had three churches, three pubs and several beer-houses, and at least 12 shops throughout the parish. We were largely self sufficient. There is now only one community run village shop which incorporates the village post office, one pub and one church.The fields and properties retain ancient names such as Claypits and Sandpits, depicting their original uses. The break-up of the landed estates, which saw the auctioning of properties between 1860 and 1922, brought a rapid decline for men, women and children employed in domestic service. The construction of the Elsenham-Thaxted Railway in 1913 gave access to the mainline to London and Cambridge. Post World War II mechanisation reduced the need for agricultural workers and turned the area into a satellite commuting village for the two cities. This line was closed in 1952 thus contributing to the increase of cars in the village. There is little opportunity for local employment and the lack of affordable housing for our young people has forced them to move from their home village to more urban areas of habitation. When this web site was envisaged, it was anticipated that there were going to be just a few interesting articles. However, the web site has taken a life unto itself and it grows monthly. Each month I will show what new articles have been included. I have used a cut-off date of 1955. If you want information regarding present Henham life visit our village website.